To all of those who argue video game addiction is a made-up condition, new research presents evidence that may make you reconsider. Adding fire to the debate as to the existence of video game addiction is a study from researchers at Iowa State University and the National Institute on Media and the Family. The study, which is based on data from a nationwide survey of 1,178 American children and teenagers, aged 8 to 18, found that roughly one in 10 video game players (8.5 percent of American youth) show signs of addictive behavior. Some displayed at least six of 11 symptoms of pathological gambling as defined by the American Psychiatric Association. (Researchers adopted the gambling addiction criteria because there is no current medical diagnosis of video game addiction). “While the medical community currently does not recognize video game addiction as a mental disorder, hopefully, this study will be one of many that allow us to have an educated conversation on the positive and negative effects of video games,” said Dr. Douglas Gentile, a developmental psychologist and assistant professor of psychology at ISU. The problem of video game addiction isn’t as simple as playing too much or really enjoying video games. Addicted gamers played video games twice as much as casual gamers (24 hours a week), are more than twice as likely to have ADD/ADHD, get into more physical fights, and have health problems caused by long hours of gameplay (e.g, hand and wrist pain, poor hygiene, irregular eating habits). Many need treatment to improve their academic performance and return to normal functioning. 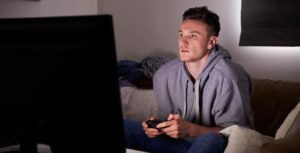 It is estimated that over 90% of young people in the U.S. play video games, indicating that up to three million could be showing signs of addiction. The gamers in the study showed addiction-like symptoms ranging from lying to family and friends about how much they play games and using the games to escape their problems to becoming restless or irritable when they stop playing. For some, video game play affected their academic performance and commitment to spending time with family and friends. Other symptoms of video game addiction include spending more time and money on video games to feel the same “high,” skipping out on responsibilities like household chores or homework to play games, excessive thinking about gameplay, trying to play less and failing, and stealing games or money to play. “While video games can be fun and entertaining, some kids are getting into trouble. I continue to hear from families who are concerned about their child’s gaming habits. Not only do we need to focus on identifying the problem, but we need to find ways to help families prevent and treat it,” said Dr David Walsh, the president of the National Institute on Media and the Family. Dubbed by some experts as a “wake-up call” for parents, this research will likely spark greater awareness of the problem of video game addiction. But what is a concerned parent to do? Ban video games from the home? Seek professional help? The American Academy of Pediatrics currently recommends that children should limit “screen time” (time spent playing video games, using the computer, or watching television and movies) to one or two hours a day of “quality programming.” If your child is playing significantly more than this, or if video or computer games are negatively affecting his school or personal life, professional help may be in order. Although the U.S. is lagging behind countries like South Korea, which boasts more than 100 clinics to treat video game addiction, there are a growing number of treatment options available to American youth. Video games feed the brain’s reward centers in a similar way that drugs or alcohol produce an appealing “high.” As such, treatment for video game addiction often centers on the same principles as the treatment for drug or alcohol addiction. Video game addiction is often a symptom of an underlying emotional or psychological issue such as depression or anxiety, and sometimes goes hand in hand with defiance, ADHD, and other conditions. In these cases, the child needs a treatment program that will address both video game addiction and any co-occurring emotional or behavioral issues. Wilderness therapy programs and therapeutic boarding schools have proven effective in helping teens with video game addiction find joy and excitement in healthier ways. With guidance from therapists and teachers, teens work to achieve balance in their lives, finding academic success, emotional fulfilment, and plenty of opportunities for friends and healthy fun.